Graphene has emerged as one of the most promising two-dimensional crystals, but the future of electronics may include two other nanomaterials, according to a new study by researchers at the University of California, Riverside and the University of Georgia. In research published Monday (July 4) in the journal Nature Nanotechnology, the researchers described the integration of three very different two-dimensional (2D) materials to yield a simple, compact, and fast voltage-controlled oscillator (VCO) device. A VCO is an electronic oscillator whose oscillation frequency is controlled by a voltage input. Titled “An integrated Tantalum Sulfide—Boron Nitride—Graphene Oscillator: A Charge-Density-Wave Device Operating at Room Temperature,” the paper describes the development of the first useful device that exploits the potential of charge-density waves to modulate an electrical current through a 2D material. The new technology could become an ultralow power alternative to conventional silicon-based devices, which are used in thousands of applications from computers to clocks to radios. The thin, flexible nature of the device would make it ideal for use in wearable technologies. Graphene, a single layer of carbon atoms that exhibits exceptional electrical and thermal conductivities, shows promise as a successor to silicon-based transistors. However, its application has been limited by its inability to function as a semiconductor, which is critical for the ‘on–off’ switching operations performed by electronic components. To overcome this shortfall, the researchers turned to another 2D nanomaterial, Tantalum Sulfide (TaS2). They showed that voltage-induced changes in the atomic structure of the ‘1T prototype’ of TaS2 enable it to function as an electrical switch at room temperature—a requirement for practical applications. “There are many charge-density wave materials that have interesting electrical switching properties. However, most of them reveal these properties at very low temperature only. The particular polytype of TaS2 that we used can have abrupt changes in resistance above room temperature. That made a crucial difference,” said Alexander Balandin, UC presidential chair professor of electrical and computer engineering in UCR’s Bourns College of Engineering, who led the research team. To protect the TaS2 from environmental damage, the researchers coated it with another 2D material, hexagonal boron nitrate, to prevent oxidation. By pairing the boron nitride-capped TaS2 with graphene, the team constructed a three-layer VCO that could pave the way for post-silicon electronics. In the proposed design, graphene functions as an integrated tunable load resistor, which enables precise voltage control of the current and VCO frequency. The prototype UCR devices operated at MHz frequency used in radios, and the extremely fast physical processes that define the device functionality allow for the operation frequency to increase all the way to THz. Balandin said the integrated system is the first example of a functional voltage-controlled oscillator device comprising 2D materials that operates at room temperature. “It is difficult to compete with silicon, which has been used and improved for the past 50 years. However, we believe our device shows a unique integration of three very different 2D materials, which utilizes the intrinsic properties of each of these materials. The device can potentially become a low-power alternative to conventional silicon technologies in many different applications,” Balandin said. The electronic function of graphene envisioned in the proposed 2D device overcomes the problem associated with the absence of the energy band gap, which so far prevented graphene’s use as the transistor channel material. The extremely high thermal conductivity of graphene comes as an additional benefit in the device structure, by facilitating heat removal. The unique heat conduction properties of graphene were experimentally discovered and theoretically explained in 2008 by Balandin’s group at UCR. The Materials Research Society recognized this groundbreaking achievement by awarding Balandin the MRS Medal in 2013. The Balandin group also demonstrated the first integrated graphene heat spreaders for high-power transistors and light-emitting diodes. “In those applications, graphene was used exclusively as heat conducting material. Its thermal conductivity was the main property. In the present device, we utilize both electrical and thermal conductivity of graphene,” Balandin added. 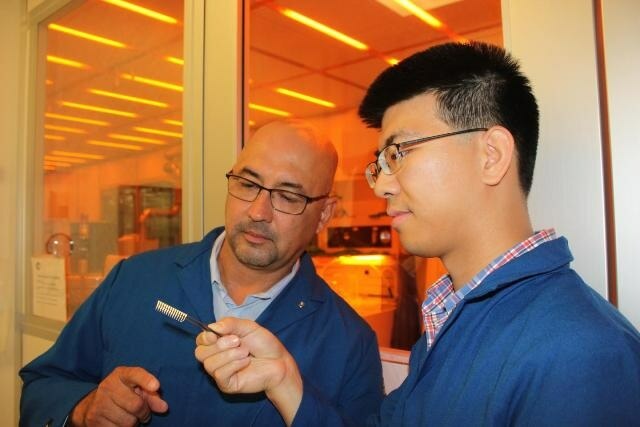 Guanxiong Liu, a post-doctoral researcher in Balandin’s group, the first author of the paper, fabricated the advanced 2D devices in the nanofabrication cleanroom facility at the UCR Center for Nanoscale Science and Engineering (CNSE). Roger Lake, a professor in UCR’s Department of Electrical and Computer Engineering, Bishwajit Debnath, a graduate student at UCR, conducted computer simulations. Tina Salguero, Professor of Chemistry, and a graduate student Timothy Pope from the University of Georgia carried out material synthesis.